3x3 Eyes began as a Japanese manga (comic) series created by Yuzo Takada. The manga was first serialized in Kodansha's Young Magazine Pirate Edition , and ran from Dec. 14, 1987, to Apr. 10, 1989. Beginning on Apr. 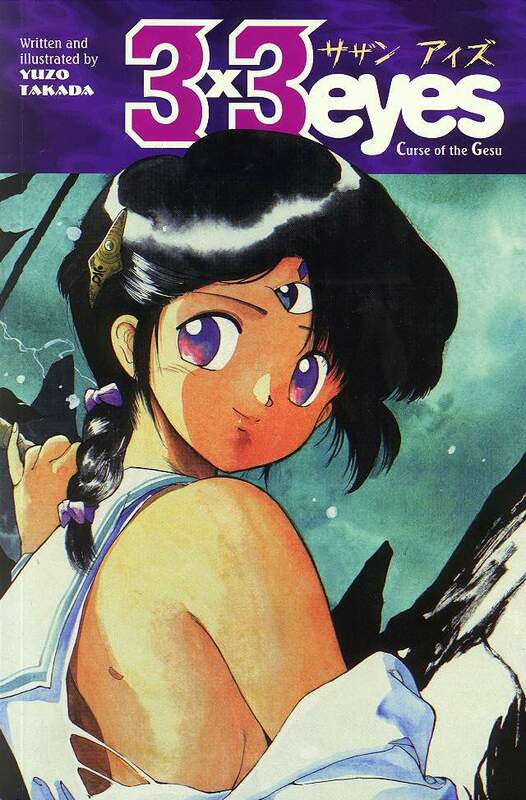 24, 1989, the manga moved to the weekly Young Magazine , where it is still being published. When enough chapters have been published, they are collected and published as a tankoubon (small paperback volume). New volumes are published about every four months. Starting with volume 18, the price was raised from 485 yen before tax to 505 yen. Yakumo and Pai travel to Hong Kong and have some adventures with Yogekisha. These stories were used for the first anime series. Yakumo finds Pai after 4 years, and they seek to restore her memory. This storyline is used for the second anime series, also named Seima Densetsu. The continuing adventures of Yakumo and Pai reveal the history of Kaiyanwang and the Sanjiyan Unkara. This was originally a departure from the main plotline that disappointed some fans. However, the plot is now back to Pai and Yakumo's quest to become human and defeat Kaiyanwang. More details about the individual manga volumes are available on the Manga Translations page. Several years ago, the 3x3 Eyes manga was translated into English by Studio Proteus and published by Innovation. Due to poor sales, the series was cancelled after five issues. Recently, Studio Proteus and Dark Horse Comics revived the series, starting by reprinting a collection of the first five comics as the 3x3 Eyes: House of Demons trade paperback. A new five-issue series of translations, 3x3 Eyes: Curse of the Gesu , was then published. These comics were also collected as a trade paperback, but Dark Horse decided not to continue the series beyond that point, again due to poor sales. The two trade paperbacks correspond to the first ten chapters of the Japanese manga. Anime Comics are comic versions of the animated videos. These comics are in color, using the actual cel art and scripts from the anime. The credits on the first series of comics are for original work (Yuzo Takada), director (Daisuke Nishio and Kazuhisa Takenouchi), screenplay (Akinori Endo), and animation director (Koichi Arai). For the second series, creator Yuzo Takada and director Kazuhisa Takenouchi are both given screenplay credits, and animation direction and character designs were by Tetsuya Kumagai. Curse of the Gesu cover scanned by me. 3x3 Eyes English translation published by Dark Horse Comics, Inc. Dark Horse, Dark Horse Comics, and the Dark Horse logo are trademarks of Dark Horse Comics, Inc., registered in various categories and countries.